Jose Maria de Servin was taken from his birthplace in Michigan to Guadalajara Mexico by his family when he was two months of age. He was a distinguished member of the group “Young Painters of Jalisco”. Later Jose Maria de Servin collaborated with Merciful Jose Orozco in works of the Legislative Palace of Guadalajara, Jalisco. Jose Maria de Servin also taught summer art courses for 15 years at the University of Arizona. Jose Maria de Servin’s mural productions were numerous. He painted important murals in union with his brothers Antonio and Miguel. His religious pictures were very well accepted in Europe. Jose Maria de Servin’s murals works are rich in color and show a high sense of the mexicanidad. 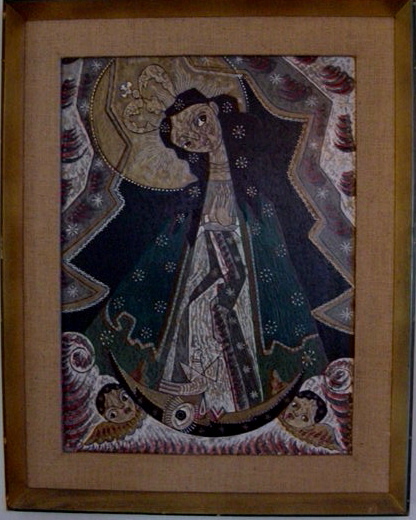 Jose Maria de Servin has works of this sort in the Regional Museum, the House of the Jalisciense Culture and the House of the Crafts as well as in the hotels Mendoza and Hilton, of Guadalajara, Jalisco. His works can be viewed in the Arcs of Phoenix, Arizona. ; The Cortijo of San Jose, Tijuana, B. C. and the Pharmacies Benavides de Monterrey, N. L.
Acquisition note: I found this piece (and a number of others in my collection) at an antique shop in Tempe, Arizona called Rare Lion. The owner there, Gary Perkins, has an exceptional eye for works of art – his major love are representations of the old west – and he’s super knowledgeable about that area of art – but he also has an interesting and eclectic collection of other works too. Phoenix and it’s surrounding suburbs is a fantastic place for any collector to acquire 2nd market pieces. As much as I love to support artists and galleries, at the time I purchased this piece as a graduate student, their prices were simply out of my league. I discovered an amazing wealth of beautifully framed, reasonably priced, original paintings and prints in the antique shops of the area. I expect this to be the case in any large city with a snowbird population. Other finds in my collection from Rare Lion in Tempe are by artists: Jaime Oates; William Brice; Jacob Landau; and Bert Pumphrey. All acquired between 1998 – 2002. Thanks for your note about the La Nuestra Snra de Guadalupe by Jose Maria Servin. Yes. I still have this painting – it’s hanging in my dining room. What is the nature of your interest in Servin and this piece? Do you still have this painting? I have been searching for Servin paintings. Please contact me. I have two. Boy and girl. Original frames. just searching again for Servin paintings and found your answer to my question. My interest is solely that I am a huge fan. My grandparents have 3 pieces from his collection of kids painted on burlap. They purchased them in Mexico over 40 years ago. I feel close to his work. …. I recently and miraculously acquired a cherub he had done on canvas from a flea market. She is beautiful and like none of the others I have seen…. I am hoping to add to my collection. Yours is beautiful. Just want to keep my out. I would be happy to email you a photo of my find! – that were passed down to me by my grandparents–Mine were purchased over 50 Years ago. Hello, my name is Eduardo, Im from Guadalajara Mexico, the reason Im writing this is because my that owns about 20 pieces of Joes Ma de Servin…Please let me know if someone is interested to buy some paintings….we really dont know the value but I think soeme will. Hello all, I currently reside in Phoenix. I have 5 pieces of his. I also love his work. Ironically I came across my first piece at the Salvation Army and purchased it for a mere $1.99, been a collector since. I believe I own the original painting “The Madonna and the Boy” (1956). If you would have any further information on the painting or a picture I would thank you to send it along. I would be happy to send you some photos to get your opinion. I have 16 of his signed and original oil paintings! all very unique! Can someone help to guide me as to how to sell my Jose Maria De Servin Paintings? I have 15 original-Oil paintings (signed)…Very interesting and beautiful display of his unique talent.